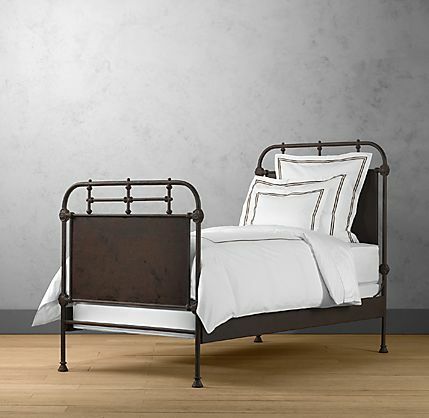 I am loving these twin beds from Restoration Hardware! They are the new French Academie Beds in metal and I think they are just what I've been looking for to go in our pool house bedroom. It's hard to find twin beds that are sophisticated and not juvenile. When we bought our wine country house, I had in mind antique iron twin beds from Italy. Two years later, these yellow wood bunk beds are still here. It's ok, but not for grown ups! Can't you just see the Restoration Hardware beds here? I'm envisioning all white bedding, seagrass and a neutral color on the walls. To get a better feel of the room, why don't you be my guest! Let me take you upstairs to the little bedroom. Here we are at the top on the little balcony in front of the bedroom, looking back down the stairs. Looking through the door to the room. Here is your view from the bed, looking out the door and beyond to the vineyards. Oh heck, you might as well just spend the night! There is a full bathroom downstairs for you. And a copper sink too, at the ready. Feel free to use the spa later. Just grab a robe from the bathroom. It's getting dark by the barbecue area. Let's sit a while and have a late night dinner. I'll say good night now. Don't be afraid, I will leave the lights on for you in case you want to take a late night swim. Here is your little guest room with those darn bunk beds! That does it, I'm ordering those French Academie beds asap! Hope you sleep well. Breakfast is at 9:00! I'll be online ordering these beds for your next overnight visit! I'm linking up to Susan at A Southern Daydreamer for Outdoor Wednesday. Be sure to check out all the other outdoor photos. how do i reserve my stay? Delores, what a gorgeous guest house! And the views are amazing. Those iron beds will be Perfect for that beautiful room! So beautiful as is the rest of your home. Your home is so inviting, and the views are to die for. It really looks like the south of France. I love the iron beds. I think they are the perfect touch for your guest room. Love those beds from restoration hardware...they will be perfect!! Thanks for the tour...unbelievable is all i can say!!! Well, that's good to know. Breakfast ENDED at 9:00am on our recent road trip. ; ) I think the new beds will look just lovely in your guest room. Wow what a beautiful little get a way!! And yes those French beds are the way to go. What a difference those beds will make to the whole feel of the room. Delores: One amazing house, one amazing post, and two AMAZING little beds! Yes, I think you are most definitely on the right track, here. They will fit the bill, exactly. Oh, for a night in that sweet little guest room ~ HEAVEN! I will gladly SLEEP ON THE FLOOR for a chance to gaze at that view and take a moonlit swim. But, as a shopping buddy I would never stop you from buying those great looking beds! Everything looks absolutely perfect as is, anything you do will only make it more so. Hi Delores, I saw these beds and fell in love. Actually I would like a room decorated just like the picture. How do you ever get your guest to leave with such a beautiful view? Takin' my breath away here!! They couldn't be more perfect. I love the seagrass and the white bedding plans, too. Your guests may never come out of the guest house! I would not care what the beds looked like...I'd come for the views both inside and out! The metal beds are great...but can't you just paint the current pair gray or black...no one will mind! I don't want to just stay the night... I want you to adopt me!! Your home and the views from your home are stunning. What a dream to live in! Can we move in with you. Just love your house. What times are available, a little envious!! LOve the first image and the art is divine! Delores, those beds are to die for. Definitely will look fabulous in that room with those killer views. When are you taking reservations! Can't wait to see the new look. Your wine country home is so amazing that I could sleep in a sleeping bag if I was your guest but those new beds would be heavenly. No matter what you choose I am sure it will be amazing. I am in the process of remodeling my beach house. Ask Maureen how decorating challenged I am. Wish you lived here so I could have you help me. You would think it was fun project. Me, I am so confused after just picking out cabinets that my head is spinning like a top. While you are placing your order...order two for me;)! I will send you my address and you can have them sent to Texas! These are gorgeous and such a deal compared to the real thing! I have had my eye on them since the catalog arrived...gorgeous! I have been revisiting some of your older posts! It is always a delight to visit here...thank you! I would love to have a guest room that wasn't right next to mine. With a room that nice I wouldn't worry about the beds! I am sure I will be very comfortable even if you don't change the beds. Delores, those beds are absolutely perfect for your guest room! And when can I book my visit?! A slice of heaven. My bags are packed. What time should we be there? Delores, the beds are beautiful and would fit so nicely in your fabulous guest house BUT... it is all so spectacular that it is not the beds that your guests will be talking about. It is your stunning land and surroundings. So incrediblly beautiful and breathtaking! And I'm sure you are a hostess extraordinare! Thanks for the tour~ I'd love to stay longer, but reality is calling! I am just hastily packing my bags! I will take the beds away for you when I leave. You are right - the beds you have now are super but the metal ones will have much more character. Oh, Dolores, you are so blessed. I am so happy for you! oops! I spelled your name wrong! Sorry, Delores! =] Well, I'll just take this moment to say that I love the print of the dress in the first photo from the catalog. Isn't that cute? My heart is going pitter pat! So lovely! I will be blogging about your lovely oil soon. I love everything in that catalog shot, too... the mirror over the bed, the artwork beside the bed, the bed itself. You are a BAD influence! Now, I want a whole new look. LOL! Just beautiful! I am sure those beds will be just perfect. Love the French Academie beds! What a pool house bedroom. I am going to pack my bags now. Be there soon! Seriously though, with a guest house and view like that, it is amazing that your guests actually leave. I laughed out loud when I ran across this post over on Catalog Living, a tongue in cheek blog about an imaginary couple that live in the images we all admire in catalogs. "OMG, those are Delores' beds!" A Jewelry Party and A Giveaway!